The athletes competing at Rio are obviously some of the agilest humans on this dusty planet. But despite high expectations for what will be seen, some still have the ability to make you feel like they could be capes in hiding. That would be an appropriate assumption after seeing Laurine Van Riessen bike on a wall to avoid a crash. It happened Saturday during women's keirin, a track cycling event where racers are paced by a motorized vehicle before moving into an all-out sprint for two kilometers. The track is pitched steeply, but the walls at the top of the track appear to be at about a 90-degree angle, making it a surface competitors aren't game-planning to use. In the final lap, Virginie Cueff (France) attempted to move into the outside lane, presumably to get an angle to pass. Instead of deftly cutting to the outside, her move made Olivia Podmore (New Zealand) and Tania Barbero (Spain) eat it hard. Van Riessen miraculously stays on her bike through the push and winds up riding the wall at the top of the track to stay in the race. She finished last in the race but won her repechage heat to get into the next round. 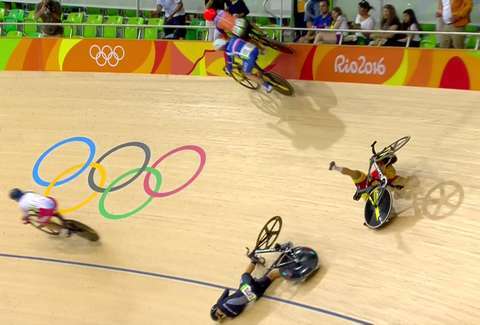 Watch the amazing feat on NBC Olympics, or get a slightly different angle on it below.